Born September 16, 1920, in Atlanta, White graduated from Druid Hills High School and earned an undergraduate degree from Emory in 1940. He went on to receive a master’s of music degree from Westminster Choir College in Princeton, New Jersey, and an M.A. and Ph.D. from Princeton. During World War II, he served in the U.S. Army Air Corps, flying twenty-five combat missions from 1944 to 1945. White was a violinist and a member of the Atlanta Symphony Orchestra. He specialized in late eighteenth-century music and was a noted authority on the violin concerto, writing books on Vivaldi, Viotti, and Wagner. 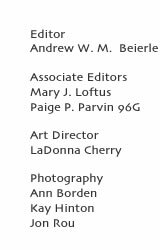 He also edited College Music Symposium from 1972 to 1974. In 1974, White became professor of music and coordinator of graduate studies at Kansas State University. He was president of the College Music Society from 1979 to 1981. In 1992, he retired and joined the faculty of the University of the South in Sewanee, where he taught part-time until 2002. James Hund, a retired professor at Emory’s Goizueta Business School and former president of Friends of Music, says White saw Emory’s art and music programs grow from a few classes in a makeshift space to a lively, thriving presence showcased in the state-of-the-art Schwartz Center. 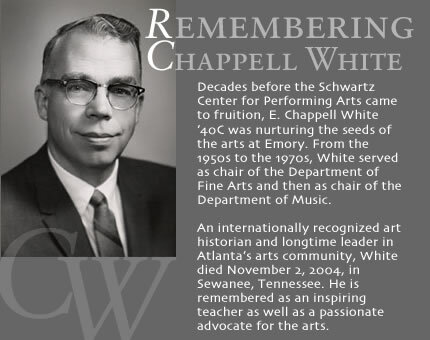 Schwartz, too, credits White with cultivating an appreciation for the arts that has had an impact far beyond his time at the University. White is survived by his wife, Barbara; daughters Patricia, a staff member at Emory Law School, and Victoria; a son, Tyler Goodrich and daughter-in-law Laura; and two grandchildren.—P.P.P.